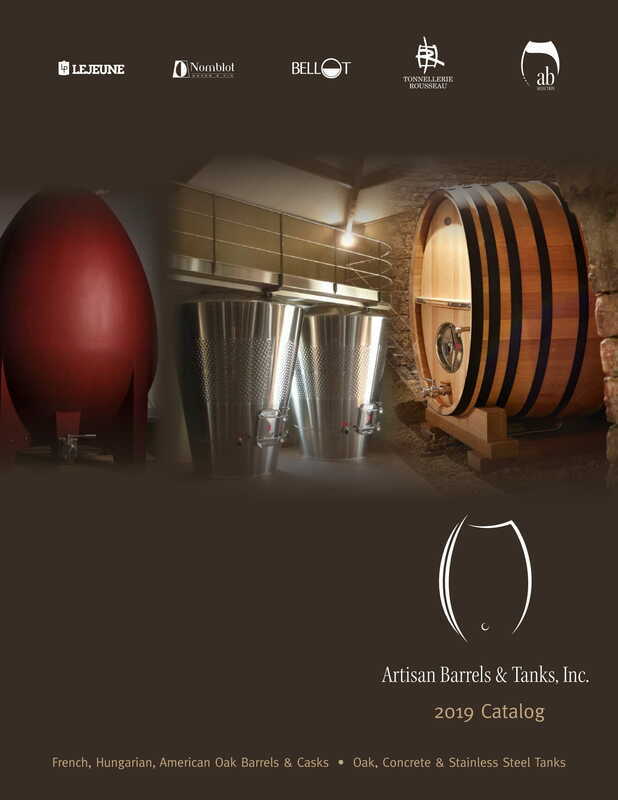 Oak Profiles - Artisan Barrels & Tanks, Inc. Some winemakers and coopers may be influenced by the geographical origin of staves (Allier, Vosges, Nevers...) in choosing or recommending a barrel for a given wine (Pinot Noir, Chardonnay, Cabernet Sauvignon...). Others will favor the staves’ grain tightness (often linked to poorer soils) and view the oak texture as more significant than its geographical identity. The combination of coopers and forests enriches and adds to the complexity of the winemaker’s blend. We also note that Burgundian coopers have had a tradition of working more with individual forests and Bordeaux coopers prefer blending forests origins and focusing on grain tightness. Burgundian wines (Pinot Noir, Chardonnay) benefit from medium-tight grain barrel ageing that seem to enhance their less tannic structure. Bordeaux wines (Cabernet Sauvignon, Merlot, Cabernet Franc ...) have been traditionally aged in tighter grain barrels (forest blend) that soften up their more tannic body due to a slower extraction. In order to achieve more consistency year after year, coopers from both Burgundy and Bordeaux tend to blend medium and tight grain as well as French forests appellations (i.e., Vosges and Allier; Rousseau House Blend Center France: Allier, Nevers, Châtillon). Ongoing barrel/wine experiments at Rousseau Cooperage have shown that wines aged in house blend barrels were more balanced and integrated than those aged in single forest barrels. As a result Tonnellerie Rousseau has introduced in 2001 and 2002 their distinctive blend barrels featuring a mix of a particular region's forests instead of a single forest barrel. Over the last 5 years, we have noticed a growing trend among coopers from Bordeaux, Burgundy, Cognac, Missouri or Hungary to better match the winemakers and consumers’ needs: in order to craft wines that express more fruit freshness, purity, coopers and winemakers depend more and more on barrels with a lower oak impact; these are barrels seasoned longer (30-36 months) with a long and slow toast and a tighter grain structure. Green staves are also hydrated naturally (rain) or artificially (sprinkler) in the seasoning process to leech out the excessive, astringent tannins. These three parameters: seasoning, toasting and grain texture have been addressed and researched extensively by coopers represented by Artisan Barrels. Bertranges: Rich and wet soil produces trees of bigger diameter with an annual growth ring showing a bigger proportion of summer wood. The grain is medium-tight and brings usually to the wine more spicy and structured flavors. Recommended for medium body reds aged from 12 to 18 months (Pinot Noir, Merlot and Cab. Franc). Châtillon & Vosges: This forest appellation encompasses several areas in the North-East of France: Vosges, Bourgogne, Argonne, Ardennes, Haute-Saône, Yonne. This wood generally releases more tannic flavors and is grown at higher elevation which results in a distinctive intense character. Ideal to build structure into a wine aged from 9 to 16 months (Syrah, Zinfandel, Grenache). Jupilles: Located at the edge of the Loire Valley, this forest offers good potential for white wine ageing with an elegant, floral and subtle aromatic profile. Recommended for white wines aged from 8 to 12 months (Sauvignon Blanc, Chardonnay, Viognier) or for lighter body reds (Sangiovese, Syrah, Merlot). Central European Oak: We are currently sourcing oak wood from Hungary for Artisan Barrels Selection barrels. This alternative oak source gives winemakers interesting flavoring tools. We note that barrels made of Hungarian oak offer rich aromas of vanilla and spices, and we recommended them for longer aged Reds aged from 12 to 24 months (Zinfandel, Petite Syrah, Cabernet Sauvignon). American Oak: The Oak Cooperage sources all of their oak from Missouri; American oak tends to showcase rich and forward aromas of vanilla and spices. The Oak Cooperage offers 2 toasts: the classic bold, sweet Tradition Series barrel (as used by Silver Oak) and the more mild and modern Tribute Series “Baccus” barrel. Recommended for White Wines where additional sweetness and aromatic lift are desired; and for longer aged Reds aged from 12 to 24 months (Zinfandel, Petite Syrah, Cabernet Sauvignon). For additional oak profile information specific to our individual coopers, please click here (link to 2018 catalog Oak Profiles page).